An Interactive Voice Response refers to the capability of guiding inbound callers through the options to self direct themselves to the desired destination within the contact center. Designing an IVR script can be simple or complex depending on your business operation. Before sitting down to design your IVR script, prepare your plan for call routing. You can create a new script and assign it to any number of channels. 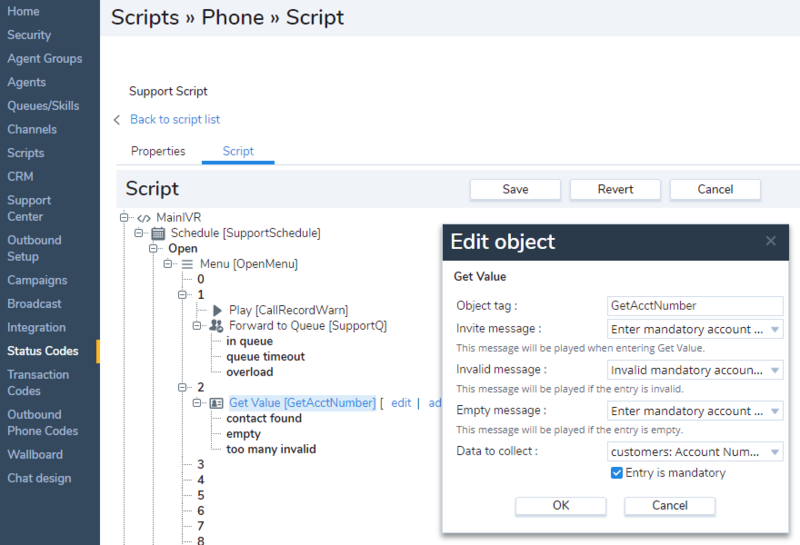 Use the Scripts tab to create or edit the Interactive Voice Response (IVR) script used to guide the inbound caller through the options offered by the contact center. Select Scripts from the configuration menu. Enter the following properties for the script. Script Type A read-only reminder of the script type. It displays if it is a phone, chat, or email script. A category helps you to organize your scripts better. For example, if you have multiple scripts serving Support and Sales needs, you can group scripts under separate categories. Select an existing category or create a new one. Select Edit Categories option from the drop down menu. In the Category dialog box, add a new category by clicking . Add comments for additional notes if desired. You can assign multiple channels to a script. Click on the link to bring up the channels list. Select desired channels from the list. Select to place this script definition into service. Click Save to navigate to the Script tab, where you define the script. Click MainIVR. The [ add] link appears. Click Save. For a primer on writing IVR scripts, refer to the IVR primitives, refer to the guide on Automated Call Processing Rules. To undo the changes click Revert. To design Email and Chat scripts select Email or Chat and then follow steps 3 to 7.